SAN LUIS OBISPO — As he prepares for another school year at Cal Poly, aerospace engineering student Jeffrey Aparicio doesn’t have to go far for a reminder of his dark past: All he has to do is look at some of the tattoos on his body. “Every time I look at my gang tattoos, I remember how I’ve come so far,” he said. “I’m very thankful because people can learn from my experience, and I can learn from theirs,” said Aparicio, 27. Raised in San Jose and Sacramento, Aparicio lost his father to liver disease when he was 13. After watching his father die, Aparicio eventually sought out older role models, who happened to be gang members. As a juvenile, he was arrested for weapons-related offenses. And on more than one occasion, his home was fired upon by other gang members. At one point, he did enroll in community college, but just as he was trying to leave the gang lifestyle behind, a fellow gang member called him to do a residential burglary. “It’s true — a phone call can change everything,” he said. According to Sacramento Superior Court, Aparicio served eight months for residential burglary. While in jail, he participated in a gang-related riot. And, as his sentence was coming to an end, he was summoned to a cell by fellow gang members facing murder charges. Aparicio feared they would either make him do something that would add to his sentence or punish him for some wrongdoing. Instead, they shook his hand. And he didn’t. After jail, he re-enrolled at Cosumnes River College, where he earned seven associate degrees. He also became a math tutor and competed in a math competition. 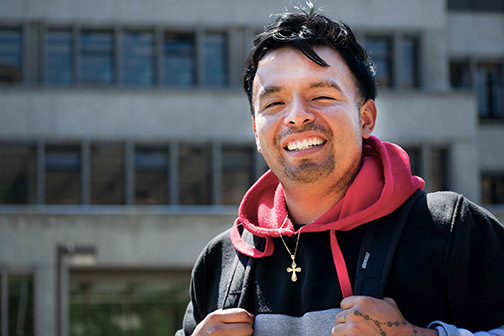 After an inspiring graduation-day speech, Aparicio became a face of the college, appearing in publicity materials on billboards, buses and movie screens. When he decided to transfer, Aparicio was accepted by several major universities, including Cal Poly. Carney suggested he become a Mustang. Aparicio plans to work in industry a few years, then return to his junior college as an educator. “I want to help those that helped me out,” he said. Meanwhile, he volunteers at the SLO Food Bank and has offered guidance to students during PolyCultural Weekend and the SLO Days new student orientation. This summer, Aparicio worked as a counselor for the Engineering Possibilities in College (EPIC) summer camps, sharing the story of his journey with future college students, and he has spoken to various groups, including the San Luis Obispo Chamber of Commerce’s monthly gathering, Good Morning SLO. Those groups didn’t see his gang tattoos, but they were under his shirt. And when he looks at them, Aparicio doesn’t feel a sense of shame; he just remembers his journey. “I’m really proud of what I earned,” he said.